October 27, 2010– The New Mexico Tech Board of Regents toured the university’s training facility in Playas, N.M., in conjunction with its monthly meeting Thursday, Oct. 21. EMRTC and its affiliates make up one of the United States' premier research and training institutions. Specialized services and research areas are provided through the following affiliates who specialize in those areas. The Energetic Materials Research and Testing Center (EMRTC) is internationally recognized and has over fifty years of expertise in explosives research and testing. EMRTC specializes in the research, development, and analysis of energetic materials for both corporate and government clients. The MicroElectronics Testing and Technology Obsolescence Program (METTOP) state-of-the-art Microelectronics Semiconductor Testing and Design Center mission is to test, evaluate and assess the wide range of microelectronic components that comprise so many of today's sophisticated military, space and commercial systems. A cooperative venture among academia, industry, and government, the Institute for Complex Additive Systems Analysis (ICASA) is dedicated to studying the behavior, vulnerabilities, and predictability of complex systems. ICASA's interdisciplinary approach delivers information-age research, applies that research to real-world problems, and develops key enabling technologies. In support of research and development, ICASA trains and educates the nation's next generation of critical systems thinkers. The Institute for Engineering Research and Applications (IERA) mission is to perform focused research and to plan, develop and implement specific technologies and activities that will provide for safe and effective use and protection of resources both now and in the future. 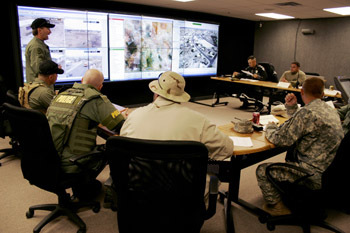 The Border Security Center for Research, Education, Training and Technical Assistance (BORSEC) has a mission to partner with state & local organizations in NM and neighboring states to obtain supplemental funding to counter border violence. To stimulate and conduct research, education, training, and technical assistance to counter border violence and protect the rights and safety of all people in New Mexico. “We are caught in an inescapable network of mutuality, tied in a single garment of destiny. Whatever affects one directly, affects all indirectly.” Martin Luther King, Jr.